I’d finished the edits of my Toronto trip and was at a bit of a loose end. It was late at night in the OCC and I had my laptop with me and noticed that I had this folder in Lightroom called “Uncataloged”. I remember that I had done some work there, but for the life of me I couldn't remember what. Stepping through the Lightroom catalog in a kind of desultory fashion, not really looking directly at the images but seeing them out of the corner of my eye I was looking for something to jump out at me. They say that if you want to see an animal, you’d see it best by not looking straight at it, especially if it was hidden. Although this is best for detecting motion, it was late in the evening and I wanted to see what would pop out of the thickets. About half way through, I came up on two images. The first had me doing the proverbial facepalm. I had given this image one star and for whatever reason it never progressed further. I don’t know why. Other images did rank higher and may be slightly stronger; this image is, in retrospect, strong as the others. It was early April when I made this image. 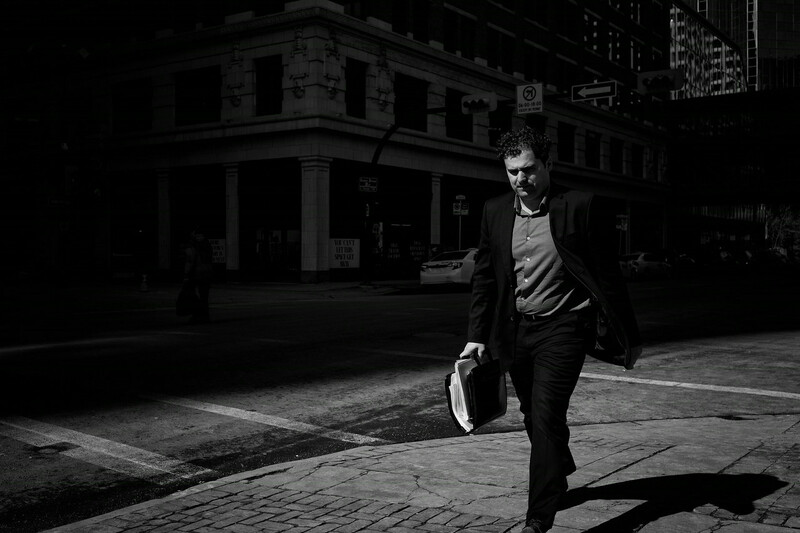 I do recall turning and reacting to this “homme d'affaires” striding through spring sun. I had metered on the sidewalk earlier and as I turned to look back, there he was. In post, I cropped a bit and then ran the image through SilverFX. A little later, I ran into an image made about seven month earlier. Again it was one of those where I had metered on the sidewalk and turning around and looking backwards to where I had come from, there she was on her bicycle. 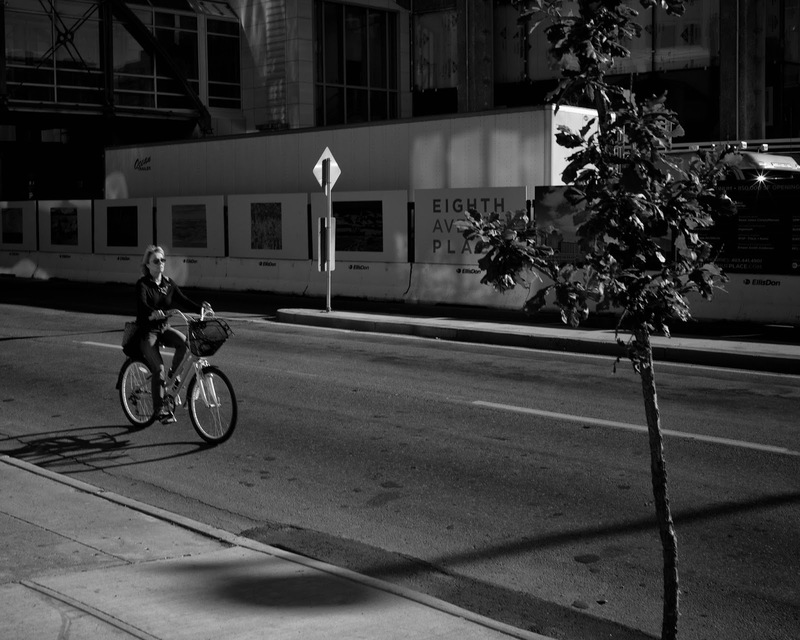 Those of you who know Calgary, will know that this street corner is usually quite packed with traffic and yet here she is, serenely cycling on a September afternoon. I can understand why maybe this one ended up on the cutting room floor as the woman is slightly out of focus. I cropped and straightened things out a bit and again ran the image through SilverFX. Always turn and look, you never know what is going on behind you. Turn back the pages and look at what you’ve discarded. You’re a different photographer today than you were yesterday, last week, last month. Go back a year and you’ll see how your sensibilities have changed and that dog of a photo may just be the one that shouldn't have gotten away.